Inside Appalachia is a production of West Virginia Public Broadcasting. Listen to the full episode below. In this episode of the podcast Inside Appalachia, we hear from folks like Blaine Taylor, a 17-year-old resident of Martin County, Kentucky, who struggles to manage basic hygiene when his water comes out with sediment in it. In 2015, Inside Appalachia reported that water districts in the central part of the region struggle to perform routine maintenance, which leads to quality and reliability problems for customers. Sometimes, districts are understaffed and underfunded. The repairs they do make are often inadequate — and fail to address the long-term problems of water loss and crumbling service lines. West Virginia Public Broadcasting reporter Molly Born, Caity Coyne, from the Charleston Gazette-Mail, and Will Wright, from the Lexington Herald-Leader, spent part of 2018 looking into this issue for a project called Stirring the Waters. They were working through the Report for America initiative, a national service program made possible in rural Appalachia with support from the Galloway Family Foundation. They discovered West Virginia would need $17 billion to connect hundreds of systems across the state to centralized utility services — both water and sewer. That’s according to the West Virginia Infrastructure and Jobs Development Council. The council is responsible for approving and overseeing infrastructure projects in the state. That $17 billion is more than the entire 2018 state budget, about four times more. By the end of 2017, only $8.5 million dollars were secured for the projects — just more than 1 percent of the necessary funds. In this episode, we also follow a group of graduate students from the University of Pennsylvania, who recently toured water plants in McDowell County hoping to help find a solution to the problem. This story was originally published by West Virginia Public Broadcasting and was produced in collaboration with Report for America corps members Caity Coyne and Will Wright, and former corps member Molly Born, as well as the Charleston Gazette-Mail, Lexington Herald-Leader and GroundTruth staff members as part of their Stirring the Water series. Read the full series here. Editor’s Note: This is the ninth story in a series titled “Stirring the Waters,” focused on the lack of clean, reliable drinking water in Eastern Kentucky and Southern West Virginia. Read the full series here. Local officials in McDowell County called a meeting in the town of Bradshaw to talk about broadband internet in West Virginia’s poorest county. But the first question from a resident focused on something more basic. The speakers assured Roberts they would not do that, and that this time, a promise would be fulfilled. In McDowell County, it’s nearly impossible to attend a community gathering — no matter the focus — without water being part of the conversation. When it comes to water, Roberts remains skeptical of any commitments handed down to her and her neighbors. She hasn’t touched the water coming out of the faucets in her Lex home in years. Instead, she drives about 40 minutes to Iaeger each week to fill up water jugs for her family from a mountain spring. “We’re tired of having to wait for things, of being that afterthought and talked about when it’s convenient, but left behind when it’s not,” Roberts said. Made of copper, steel, plastic and terra cotta, hundreds of miles of pipes weave underneath West Virginia, forming more than 500 water and sewage systems that serve a majority of the state’s residents. Not Roberts, or thousands of others who live in small hollows and communities nestled in nooks throughout the state’s natural mountainous terrain. According to the council, 62 percent of structures in the state are connected to a water system, and just 46 percent to a sewage system. Lex is one of those communities where many residents go without, and the council estimates that $17 billion — more than three times the state’s entire 2018 budget — would be needed to connect the hollow and the hundreds of others like it throughout the state to centralized utility services. While a majority of that estimate is for extending lines for new connections — $2.3 billion for water and $10.7 billion for sewage — $4 billion is needed for rehabilitation work to ensure the current infrastructure still works. As with the rest of the country, much of West Virginia’s water piping was laid in the early 20th century. Most has a lifespan of 75 to 100 years, a timeframe that has already expired in some places and is quickly approaching in others, said Amy Swann, director of the West Virginia Rural Water Association. In many areas, this infrastructure was developed by coal companies operating company towns, and was handed off when coal production slowed and companies left. Residents were often ill equipped to operate the systems — the most qualified workers usually left with the companies — and early mismanagement and lack of necessary maintenance set many systems up for premature failure, with pipes giving way before their estimated timemark. Mavis Brewster, director of the McDowell County Public Service District, said that’s the case for nearly every community sitting along U.S. 52, the rural county’s main route. The McDowell County PSD has made a practice of acquiring small systems in the region when they are unable to effectively serve their customers. Now operating 16 separate systems in the county, soon to be more, Brewster is an advocate for consolidating utility systems. “Regional systems are the way to go. Sometimes, especially [in Southern West Virginia] geography can make them unfeasible, but when they are, it’s great,” Brewster said. But some communities are too far apart to regionalize, and residents have other concerns. After a project to improve water infrastructure in the towns of Northfork and Keystone, the McDowell PSD will take over service for the two towns. Brewster said this almost certainly will mean improvements for customers of those systems, both off which are considered historically noncompliant by the U.S. Environmental Protection Agency. Northfork residents approved the referendum proposing the county PSD’s takeover in 2014, but Brewster said the support wasn’t always there — McDowell County PSD had offered its services to the town in the past, but couldn’t get residents’ approval. Throughout the entire state, but especially in Southern West Virginia, people take immense pride in the things they can independently own and operate, Swann said. For many community leaders, handing over something like a water system to a larger, neighboring entity can feel like handing over a piece of their independence. A few miles down from Northfork is Keystone, where residents don’t have meters for their water. While the water quality is questionable — the town has been operating under a boil-water advisory since 2012 — residents pay about $25 a month no matter their how much they use. But if they don’t pay, there’s no valve that can be turned to shut off the water. Essentially, it’s free, Brewster said, and when the PSD takes over, residents know that’s going to change. Vondalere Scott, the town recorder and former mayor of Keystone, worries that that the county’s takeover of the water system will mean less revenue for the town, which is already buried in debt. The reality, though, is income from water bills does not compare to expenses accrued by the system, Brewster said. Regionalization, while perhaps difficult in the short term (correcting inadequate systems can be more expensive than forming entirely new ones, according to Brewster), is a crucial strategy for long term viability. West Virginia is one of two states to lose population over the past decade, and much of that loss was centered in Southern West Virginia, according to a study by Pew Charitable Trusts. Since 2007, more than 18,000 residents have left the state. That makes it even more important for smaller systems to band together, regionalization advocates like Brewster argue. Geographically, water and sewage connectivity has grown in the last 10 years, but out of the 44 public water systems operating in Southern West Virginia’s coalfield counties — Boone, Lincoln, Logan, Mingo, McDowell and Wyoming — just 13 reported serving more customers in 2017 than in 2007. For the 22 sewage systems in the same counties, just four saw an increase. But more people connected through the same sets of pipes, intake systems, treatment plants and reserve tanks means more people at risk if something goes wrong. In 2014, thousands of gallons of chemicals spilled into the Elk River just upriver from the main Charleston intake center for West Virginia-American Water, a private company that has offered water services in the state for more than 100 years. 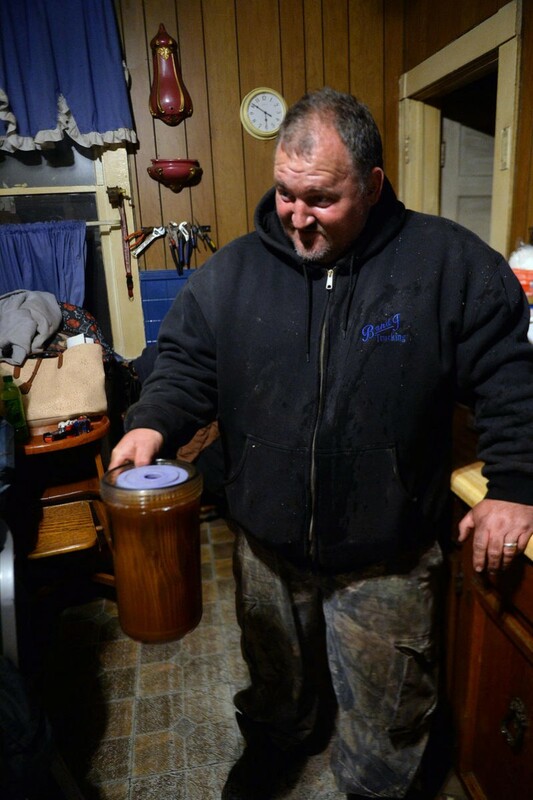 The spill left 300,000 people in nine West Virginia counties connected to WVAW without potable water. A relatively small number of people in the same region, though, were connected to small, community water systems and didn’t have any problems.. In the 1990s, leaders at West Virginia-American Water saw the regionalization trend on the horizon. The company began using public-private partnerships to soak up smaller systems as they fell behind. Because it’s so large, West Virginia-American is able to disperse costs for projects among more of their customers, so rate increases don’t hurt as much, said Dan Bickerton, the company’s director of business development. “If you have less customers and more costs, your rates are going to continue to go higher and higher and higher, or your system is going to continue to deteriorate, and you don’t want those things to happen,” Bickerton said. Jackie Roberts, director of the PSC’s Consumer Advocate Division, agrees that regionalization can help correct small, failing water systems. But she cites West Virginia-American’s practice of taking over systems in central West Virginia as a major reason for the company’s rate increases. Other than revenue from customers — which solely cover operating expenses for the utilities — community systems often rely on local governments to pay for rehabilitation work and line extensions. According to the United States Conference of Mayors, localities bear the brunt of responsibility for funding water projects — 98 percent of financing for water and sewage infrastructure throughout the nation is done by local governments. County commissions and town councils may not raise the money, but they apply for and get funds from grant programs, nonprofits and other agencies. Grants are the most sought-after funding source for water projects, according to Marie Prezioso, director of the state Water Development Authority, the funding arm of the IJDC. There are fewer grants in recent years, though, a struggle that is also felt at the Rural Water Association as it tries to help small community water systems. As grant funding has shrunk, water and sewage systems have started using more low-interest loans to fund their projects. Loans are funded through the Drinking Water Treatment State Revolving Fund and the Clean Water State Revolving Fund, two federal-state partnerships managed by the WDA. The federal government designates money to these funds annually, but most of the spending power comes from interest and payments on loans granted to systems for projects in past years. Low-interest loans can still bury small water systems in debt. Projects can take years to complete; that’s years before new customers can be added and provide a system with more revenue to pay off debt or pay for other maintenance, Brewster said. The state hasn’t provided as much funding for such projects in recent years, according to Prezioso. The West Virginia Lottery, one of the largest sources of infrastructure funding, granted $46 million in 2014, but just $26 million in 2015. Those numbers are rising again, but the lean years had a real effect, she said. In all, 144 proposed sewage and water projects were approved by the IJDC for construction in West Virginia, at a total of nearly $700 million. By Dec. 31, 2017, only $8.5 million — just over 1 percent of necessary funds — were secured for the projects. If these projects were completed, they would connect 6,170 more customers — 3,063 water ratepayers and 3,107 wastewater ratepayers — to a centralized service. They could also improve service for upwards of 50,000 customers in the state. While more secure and available funding could certainly improve how water and sewer utilities operate now, Swann is part of a minority that does not think throwing money at the issue can solve it. There will always be more need than available funds, she believes, and even if all pipes could be replaced today, utilities still need a way to maintain them, or else they’ll find themselves in the same position a few years down the road. With limited and ever-shrinking external funding pools, systems are often left with little choice but to raise rates, a sometimes daunting process that can be made even more challenging by local political interests and policies at the West Virginia Public Service Commission, Swann said. When a system wants to propose a rate hike, it must hire attorneys and accountants to audit its finances and prepare a report for the PSC. Brewster said McDowell County PSD pays an average of $10,000 each time it requests a rate increase. While the PSC does have systems to help small systems afford these costs, it’s just more red tape in an already grueling process, Brewster said. Most times, the PSC will suggest a lower rate than proposed in an attempt to lessen the burden for customers. A study commissioned in 2014 by the West Virginia arm of the RWA and other water-focused organizations in the state analyzed how West Virginia regulates its utilities compared to other states. It found that the PSC rejects the fully requested amounts for rate increases “by a magnitude greater than” other, comparable states. Swann wants to see the state reform the way it handles rates for water and sewage. The 50 State Study found that only seven other states in the nation regulate water or sewage utilities relatively as strongly as West Virginia does. In the past, the RWA lobbied to update state code and deregulate parts of the PSC to make it easier for systems to build up capital and access other assistance they need. For Jackie Roberts at the PSC, proposals to decrease oversight for systems can be concerning. While she understands the need for more revenue, she worries about the risks that could come to consumers if systems aren’t watched. In 2015 a bill passed, allowing larger systems that operate as political subdivisions — those with more than 4,500 customers and $3 million in annual revenue — to not be regulated by the PSC for rate increases (within reason) or construction project proposals. Last legislative session, a bill that proposed to do similar for smaller systems died in committee, much to the frustration of Swann, since this one would have assisted the community systems she feels need help the most. Roberts expects to see other, related legislation floating around this upcoming session. She worries that, if passed, having less regulations through the PSC could mean more risk for consumers. While agencies and organizations may hold differing views on what should be priority for handling how water and sewer systems operate, most agree on two things: changes need to be made, and those changes will only be successful with strong, unwavering community support at the local level. This can be difficult, as residents in many areas — like Sandra Roberts in Lex — have grown apathetic after feeling as though they’ve been written off for years. The more residents that can rally for ownership or changes in a water system, the more influence they have — in 1980, that’s how McDowell County PSD was formed: women in the region, specifically in Caretta and Coalwood, would not step down from demanding access to clean, reliable water in their homes. So the PSD was formed by the county, and handed over to the woman who started the movement. Editor’s Note: This is the eighth story in a series titled “Stirring the Waters,” focused on the lack of clean, reliable drinking water in Eastern Kentucky and Southern West Virginia. Read the full series here. In Southern West Virginia, reliable access to clean water doesn’t just mean getting what you pay for. Sometimes, you don’t have the opportunity to pay for it. Allen Adkins has been trying for years to get water lines extended to his Lincoln County home. Without that, he and his family are left to depend on a set of wells that leaves them uncertain how long water will last each day. Adkins has lived in his hollow off Harless Fork Road for most of his life. His father built the house Adkins lives in now, his sister is right next door, his brother lives up the road, and Adkins owns another house a bit further back in the hills. In his decades in the area, Adkins has drilled three wells on his current property, and several at other houses. His habit of counting developed years ago, after his first well began to run dry and he started to pick up on the signs. His current well has performed the best out of the three, only drying up temporarily a handful of times in the six or so years he’s had it. Still, he constantly worries what will happen when it — inevitably — goes dry permanently. He paid $3,000 to drill his last well, a steep price for the 65-year-old retiree, and he doesn’t think there’s much viable land left on his property to drill another one. In 2013, Adkins and several of his neighbors and family members filed formal complaints with the West Virginia PSC. They wanted any of the surrounding water districts to extend service to their hollow. “We have three water companies coming through [this area], and we can’t get either one,” his brother, Randy Adkins, who lives nearby, wrote on the complaint form. Well water, when treated correctly and maintained, can produce perfectly drinkable water, but Allen Adkins does not trust his wells. Water testing has returned mixed results, and he doesn’t see himself paying for such tests regularly — between $100 and $200 for the testing itself, and depending on what’s found, up to hundreds more for chemicals to treat the water. He’s been doing this for so long, the costs have added up, and he’s growing tired. In 2011, according to Adkins and the Infrastructure and Jobs Development Council, the Branchland-Midkiff Public Service District had plans and money for an extension that would run lines right to the Adkins property. Allen Adkins and about 10 others paid a tap fee — $250 each — and waited. The water never came. They were told the district ran out of money before the project reached their neighborhood. A staff memo issued by the PSC after complaints filed by the Adkinses indicates that’s true — cost estimates from the project engineer showed there wasn’t enough money. If the Adkinses and their neighbors wanted to be connected to a water system, the PSC memo reads, they would need to pay $20,000 per customer. When PSC engineers and other staff member weighs the benefits of an infrastructure project against how many people would benefit and the utility’s financial standing, it may find the project “monetarily infeasible,” meaning it can’t qualify for state funding. If that happens, residents are told how much they would have to pay out of pocket to make the project happen. Since these projects are often expensive — especially in areas like the Adkinses’ hollow, where rough terrain means more difficult work– breaking it down for individuals doesn’t breed much hope. Just a tenth of a mile down from his home a fire hydrant sits on his neighbor’s property. He said that’s where the public water service stops. Many areas unconnected to water services are similar to the Adkinses property: small communities or hollows with a handful of people, buried behind mountains and hard to access. It’s a challenge, too, to convince current customers to pay more to cover the costs of extending services to those areas. So, without public water, Allen Adkins continues to count. Those in his home — a revolving door of children, grandchildren, cousins and other relatives — coordinate schedules for laundry, showers, doing the dishes and cooking. His son and grandkids help him haul buckets of water into their home, but as he ages, it becomes more difficult. Power outages — which are impossible to predict and in some cases last days — knocks out the pump at his well, leaving the well unusable. He keeps barrels full of reserve water on hand, but he never knows if it’s enough. Adkins doesn’t hold a lot of hope that he will ever see public water pipes run on his property. He remembers being a boy, helping his mother fish water out of an old chain well. “We should be past this by now, we should have more. It’s 2018,” he said, shrugging his shoulders and looking down at his kitchen table. “My father, when he was still alive, he didn’t think he’d ever see a blacktop road running through here, and he did, he was able to, just a few years before he passed. 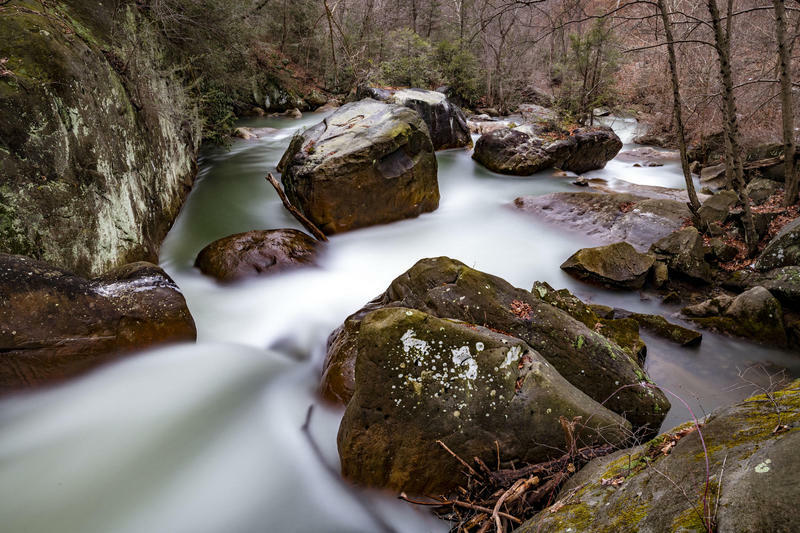 Editor’s Note: This is the seventh story in a series titled “Stirring the Waters,” focused on the lack of clean, reliable drinking water in Eastern Kentucky and Southern West Virginia. Read the full series here. Each morning Tina Coleman turns her faucet, she waits to see what color the water will be when, or if, it flows out. Some days it’s blue or green — earthy tones that could be comforting in a river bed surrounded by trees, instead of filling the porcelain tub she uses to bathe her 9-month-old grandson. Other days, the water looks like different shades of rust: deep, coppery reds and browns. Sometimes it’s white and cloudy, as if a powder, thoroughly stirred, is about to dissolve. “You never know what color it’s going to be when it comes out. It’s like a kaleidoscope,” said Cierra Coleman, Tina Coleman’s 18-year-old daughter, and mother to 9-month-old Keaton. Even on good days, when the water flows mostly clear, it can leave anything it touches gray. “It turns our nails gray, our laundry gray — look at this,” Cierra held out her arm to show the noticeably off-white tinge of her Mount View High School sweatshirt. “We don’t even buy anything white anymore. What’s the point? Tina Coleman and her husband, Chris Coleman, grew up in McDowell County. 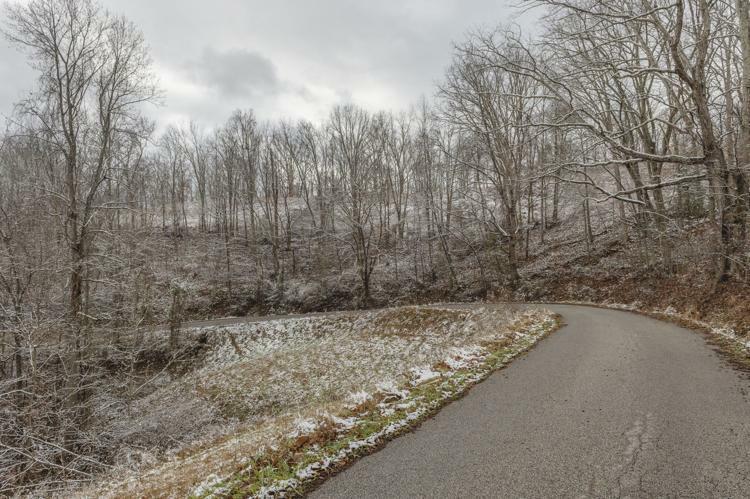 After spending several years in different states raising their family, she brought them back in 2010, wanting to show her children the corner of Appalachia where she was raised. When the Colemans made the decision to move back, they knew it wouldn’t be easy. McDowell is one of the most impoverished counties in the nation, and more people per capita leave it each year than any other West Virginia county, according to census data. Fewer than 18,500 people live their now, compared with more than 95,000 people In the 1950s. Once the largest coal-producing county in the United States, 38 percent of McDowell residents now live below the poverty line — more than double the national rate. The county ranks among the counties with the most people hospitalized from opioid overdoses nationwide. Tina Coleman knew all that. But she wasn’t prepared for seven years of unreliable water service, or what she calls indifference from community leaders about the problem. Coleman lives in Gary, a city off the Tug Fork River with fewer than 1,000 people. But frustrations with city water and sewage service, and worries about how that affects her loved ones, have pushed her to look for another place to call home. “We all live with it, but no one ever says anything. [The city] does as they please, and it seems other people, it’s almost like they’re intimidated to say anything,” Coleman said. “We’re at their mercy and they’ve given us no other choice. “If you can’t provide us our basic needs — that’s what water is to us — why would I live here?” she asked. The Colemans spend most of their time at Tina’s Flowers and Gifts, a boutique store Tina Coleman opened off U.S. 52 in Welch in 2011. There, the water flows clear, bills are affordable and Tina Coleman said there is rarely an issue. That’s what she’s looking for: relief from the $200 she spends monthly on bottled water and filters for her faucets, which are often a deep rust color when she changes them every two weeks. Before it was a city, the Gary area was a web of small towns and hollows surrounded by more than a dozen coal mines, all owned and operated by U.S. Steel Corporation. Up until 1970, the company owned all the land and property within the region. The Charleston Gazette reported that the company ran the water plant, picked up garbage and provided electricity. It performed maintenance on the system, taking care of problems as they arose. Soon though, as coal production slowed in the region, U.S. Steel began to pull its resources from the city it created. In September 1970, U.S. Steel moved to incorporate five coal camps — Gary, Wilcoe, Thorpe, Elbert and Filbert — into one, the city of Gary, named for a founder of the company. Coal mining families, who were renting homes at bargain prices, were offered a chance to buy them. The company donated its water plant to the city, all in an effort to cut tax and maintenance burdens. Without company support, there was no one left to maintain utility systems — trained engineers were some of the first to leave when coal mines began shutting down. As U.S. Steel shrunk its operations and paid less in taxes, the city got less money to pay its bills. Perhaps most importantly, as coal mining jobs left, no other labor sector rose to take its place, leaving many residents jobless in what was once the fifth-largest coal producing city in the state. Coleman and her neighbors rely on a water system that, for the most part, relies on the same pipes donated to the city nearly 50 years ago, with few upgrades since then. It’s not just Gary, though. Residents throughout Southern West Virginia’s coalfields, in different towns that relied on different companies, will swear the same story applies to them. Corporate reliance, according to residents and others familiar with the area’s water infrastructure history, cursed West Virginia’s industrial waterways. “These communities were developed to house workers to mine coal. [Coal operators] were not interested in, for the most part, planning,” said Amy Swann, director of the West Virginia arm of the National Rural Water Association. “They were interested in, ‘How can I put this town up in the cheapest way possible and move on?’ and that’s what they did. Swann, though, is not confident more money will fix issues in McDowell County or similar areas. In West Virginia, boil-water notices are posted for any system with issues that could affect the quality of the drinking water: potential chemical contaminations, inadequate disinfection, line breaks that can lead to sediment in the pipes (and to discolored water, like for Coleman in Gary). Those notices warn residents of the potential danger and urge them to boil water before using it, or to avoid it until further notice. From 2013 to 2018, more than 7,000 boil-water notices were posted for water systems in the state, according to a log kept by the West Virginia Bureau of Public Health. Walt Ivey, director of the bureau’s Office of Environmental Health Services, said it’s important to note that not all those advisories mean water coming through a faucet is dangerous. Over the last five years, Gary residents have been told to boil their water before using it for a total of about 50 days. But for residents in some surrounding areas, places where Tina Coleman might considering moving, 50 days in five years is next to nothing. In O’Toole, a small community about 15 miles from Gary, residents served by the town’s water system have been under a continued boil-water notice since May of 2002 — more than 16 years. In Keystone, another small town about 15 miles northeast of Gary, a boil-water advisory has been in effect since 2012. At least nine community water systems in West Virginia have been under boil-water advisories for longer than five years, according to the state, and all operate in Southern West Virginia: four in Wyoming County, two in Mercer County, two in McDowell County and one in Fayette County. The reason for the boil-water advisories — which are reissued every three months when necessary — are consistently listed as a failure to monitor the drinking water, inadequate disinfection of the drinking water and lack of a proper system operator. Water systems throughout the nation face similar problems. The National Rural Water Association says a wave of the country’s water operators, many baby boomers, are expected to retire in coming years. Swann said it’s already happening in West Virginia — and recruiting to fill those positions isn’t easy. Water system operators require different trainings and certifications, depending on the size of the area they serve. Hours are long, trainings can be grueling, pay is not competitive to other, perhaps simpler, jobs — like flaggers for construction companies, Morgan said — and sometimes, for operators, it feels like the weight of the world rests on their shoulders. Early in his career, Morgan worked a nearly 48-hour shift at a facility because someone else couldn’t come in. “That’s what you do — the water doesn’t stop running, so you can’t either … You work long hours, and you have to be on top of it at all times — really, you’re responsible for people’s health, their safety, too,” Morgan said. In Southern West Virginia, with dwindling population, fewer people are capable or willing to take on the job, or even aware of these job opportunities. Less money is available to hire more employees, or to upgrade and maintain systems, which could lighten burdens for operators. Without qualified operators to monitor or disinfect systems, health officials like Ivey don’t have the information they need when it comes to the quality of the water. West Virginia’s Bureau for Public Health relies on information from its five regional offices to issue or reissue boil-water notices. Those notices show the agency knows about systems that face long-term struggles, but Ivey said the bureau’s hands are tied when it comes to offering support like more testing, which could alleviate residents’ concerns, or at least clarify the problems. Sanitary surveys, performed by the state intermittently, help water systems identify areas where they need help. But not much is done past identifying, Ivey said. “Generally, it is an issue of having enough revenue,” he said. Revenue that could help them become compliant were it spent on necessary improvements currently hindering that. A lack of money and people — the same issues that hold local water systems back — also impede the state agency that could, under different circumstances, help them. Seven of the nine Southern West Virginia water systems under boil-water advisories for more than five years — all except for Green Camp PSD, which serves 44 residents in Brenton, Wyoming County — are considered serious violators for drinking water standards by the federal Environmental Protection Agency. All have had violations for the last 12 quarters on record. Coal Mountain Water — based in Wyoming County, with 118 customers — has racked up more violation points (574) and more outstanding violation points (544) with the EPA than any other West Virginia community water system over the last five years. According to records filed with the EPA, state inspectors performed an informal inspection on the system in October 2017. Before that, inspectors did a sanitary survey in 2013, and listed significant deficiencies in almost every category. The 10 water systems with the most formal enforcement actions for drinking water violations are in Southern West Virginia. Seven of those also have long-term boil-water advisories. Filings with the EPA and the PSC do not indicate that those systems receive any additional resources or water testing to quell customer worries, or that any efforts are made to correct violations or enforce orders.